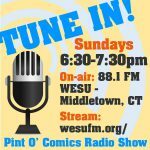 Scary things, creatures, critters, creepy-crawlies and monsters of all walks frequently invade the studios of Pint O’ Comics, partly because we enjoy them, but also because the people we are entertained by are just as fascinated by the freakish fiends as we are. It’s a cyclical fandom, as the fondly recalled creations are shared with the frequency of a handshake or clap on the back. 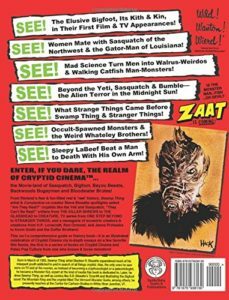 This extends to the 2017 tome of exceptionally individual filmed works that make up the collection of writer Stephen R. Bissette’s Cryptid Cinema. Over two hundred pages in length, each of which is packed to the literal gills with images, art and snippets from a variety of sources, Cryptid Cinema is an actual cornucopia in squarebound form. The book will either engross the reader or frighten them off as each chosen creature, or Cryptid, as Mr. Bissette calls them throughout, is written about at length, with a ferocity that borders on the vehement insanity of some mad doctor. Some of the Cryptids written about stretch from Star Trek monsters to a variety of Sasquatch to an unusually detailed missive on a thing called The Glasshead. This is fandom at its most intense, as the meticulously researched topics meander about wildly, yet always lurch their way back to the subject at hand, like a stumbling, shambling swamp creature searching for prey. One who might know Mr. Bissette could either feel eminently sorry for his editor, or mightily jealous of him, for having to corral the writer’s ravings. This reviewer feels both, and on many, many of the pages read and re-read. Cryptid Cinema is just that, a book that lends itself to re-reading often. 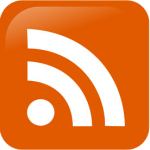 It’s densely packed with references, thoughts and morsels of information leading anyone to all sorts of discoveries, or at the very least, a new look at an old favorite. Little is left out when it comes to a Cryptid reference, diving deep into magazines and comic books, as well as the actors portraying the creatures discussed. Fans of the writer’s work will undoubtedly find themselves grinning maniacally along with Bissette’s frenzied patter, discovering a fellowship with him as he lures you into his own personal enjoyments. As a professional work, it stands out as being exactly what it should be, fanatical expression of a fan for fellow fans. You’ll love it. 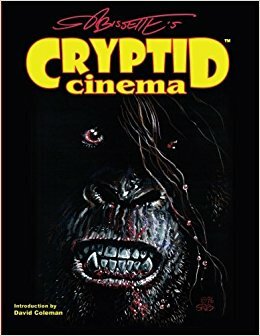 Cryptid Cinema: Meditations on Bigfoot, Bayou Beasts & Backwoods Bogeymen of the Movies was published by Spiderbaby Graphix and Publications in late 2017 and is currently available at Amazon.com for ordering purposes. It can likely be obtained at the more eclectic and smart bookstores, if they’re shrewd enough.